Wow, this part of Australia is well worth travelling the extra miles for. There is such a variety of activities and experiences on offer, so ensure you leave enough time in your planning to encompass them all. Taking advantage of Air New Zealand’s direct flights from Auckland, we arrived in Perth and transferred to the roomy KIA Carnival for our site seeing. There is plenty to do in and around Perth city. 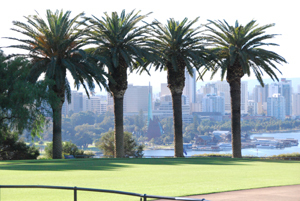 Kings Park is an ideal way to look-out over the city and enjoy Western Australia’s flora and fauna. We then took a short drive to Fremantle, visiting the Maritime Museum. We did not linger long in Perth as we excitedly anticipated our incredible adventure further North. Skywest Airlines flew us throughout the areas of Monkey Mia/Exmouth and Broome. Friendly staff offering great service, and ground assistance. An iconic and popular fish market and restaurant. Also selling fresh seafood, available to take-away or cooked for you on the premises. 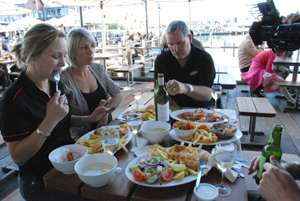 Here we enjoyed a tasty lunch of battered Dew Fish and bowls of garlic prawns. 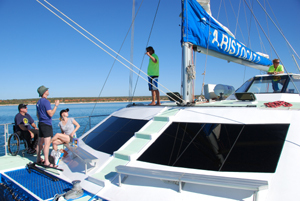 Monkey Mia offers an ideal family seaside holiday, with daily dolphin feeding on offer. Being a heritage area the sea life is prolific and interactive. Snapper fishing was great sport as they leapt out of the water to take baits like a frenzy of piranha! From Monkey Mia we drove the 700kms north to Exmouth. The favourite all round experience for this area was swimming with the wild whale sharks... the worlds largest shark and non-man eating! We also took our cameras on a dive to look at the spectacular abundance of sea life existing under the Navy Pier. This is a must do place. 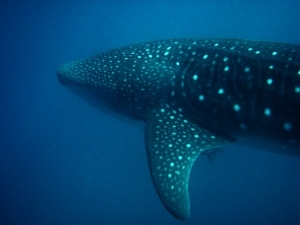 Diving with the Whale sharks, Manta Ray/Humpback tours, snorkelling/diving reef adventures. Rooms range from 3 Bdrm Beachside Apartments to Studios. Accessible: Excellent Disabled bathroom. Easy access to all main resort areas. In-house restaurant/bar with accessible toilet. Eco Beach is a breathtaking time-out spot just an hour out of Broome. Overlooking the ocean you can enjoy a superb meal at the restaurant, a quiet drink at the bar, or a dip in the lap pool. It is an ideal retreat, assuring peace and comfort in a self-sustaining environment. Accessibility: Huge bathroom with shower. Limited grip rails by fold down seat. Resort access has undulating terrain but assistance is available to transport to main restaurant/bar area. Estuarine fishing is always exciting, with an abundance of different species lurking beneath the brackish waters, or a chance to head out in the open and chase a tuna or two. Pinctada is located in the hotel hub not far from Cable Bay where you can enjoy the famous sunset camel parade. Gateway to “The Kimberleys”, Broome flourishes in tourist activity. Here, you will not be in a hurry to leave shopping off your list with great local market activity, and a variety of outlets to purchase exquisite Broome Pearls. For historical insight we visited the local museum, Pearl luggers Museum and Japanese Cemetery. The fishing was superb!... 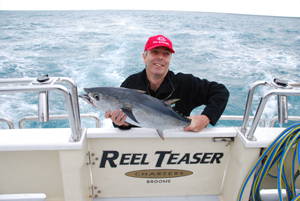 and no hesitation in encouraging “Real Teaser” for an outstanding fishing experience. Accessible: Large well set up Bathroom. Access ramped through main areas of resort. Superb sport fishing, offering day trips and longer stays in luxury.